Cape Town and although it doesn't get as cold as in many other parts of the world, the temperatures can drop regularly below 10 degrees Celsius / 50 degrees Fahrenheit at night while day temperatures usually vary between 12 degrees C / 53.6 F and 22 degrees C / 71 Fahrenheit on nice sunny days. 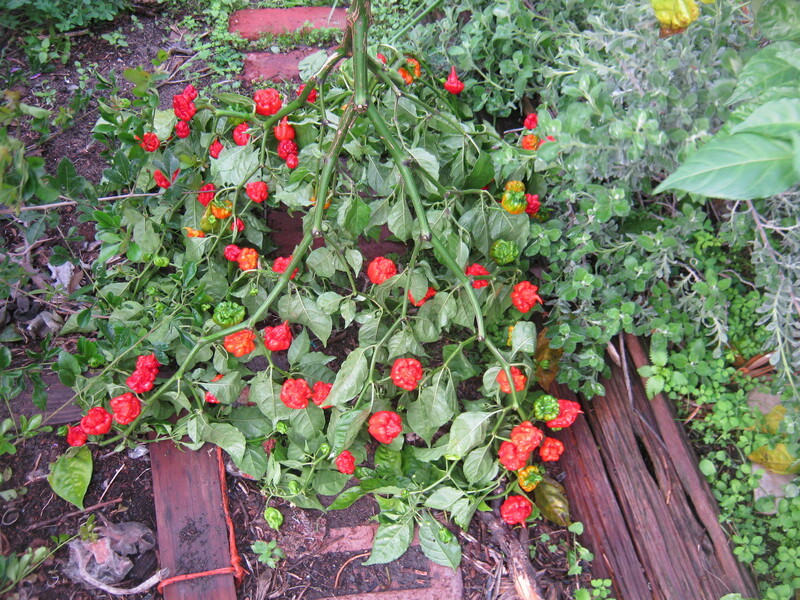 For Carolina Reaper plants this is a month that marks the end of the growing and fruiting season. 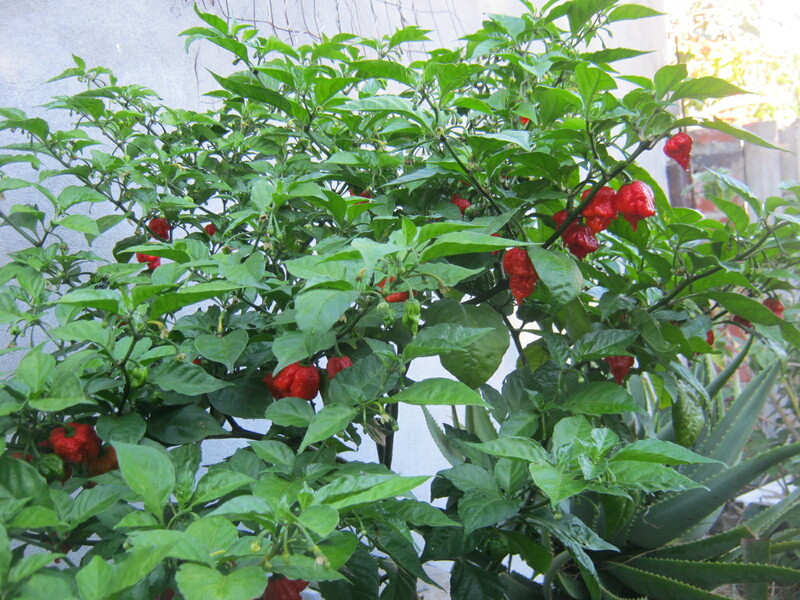 At the beginning of the month we still had sunny and warm weather and the Reaper plant was flourishing, but on the night of the 6th of June Cape Town was hit by one of the worst storms in the last 30 years and that sadly had an impact on my priced Carolina Reaper plant as well :-( ! When I made my daily patrol through the garden I found the main branch of the plant broken off and lying up side down next to its pot. Although the plant was placed in a wind sheltered place the heavy rains and the storm had placed to much strain on the branch and it had broken off cleanly. So my lesson for next season will be to support the branches of the plants properly once they start fruiting. The 2 side branches of the plant were still intact and I immediately tied them up to some trellises to support their weight and prevent them from facing the same fate as the broken off main branch. Once the remaining branches of the plant where protected I went to make the best of this sad experience. It was time to harvest the fruit and record some of specs of the broken off branch. One of the greatest joy of a gardener is to harvest the fruits of his labor and to finally getting to see how many fruit my Carolina Reaper plant had produced after 9 month of nurturing was exciting. 14 Orange / Green (partially ripe ) chili pods. I was curious about that single red pod with the black markings and cut it in half. What I found was quite interesting. 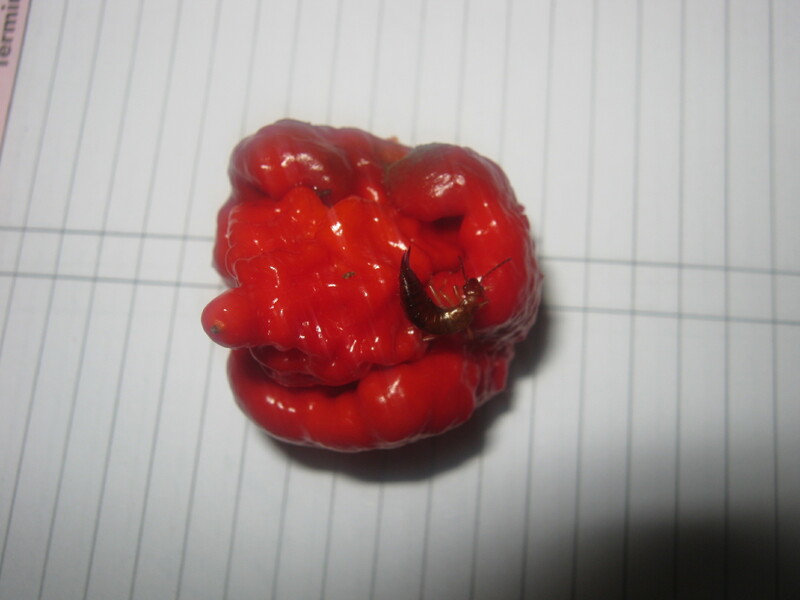 The chili fruit was inhabited by a single ear wig which was obviously immune to the hotness of the fruit and had nourished itself to an extend that the pod had started to decompose. The following photos show you the culprit and the damage it had caused. 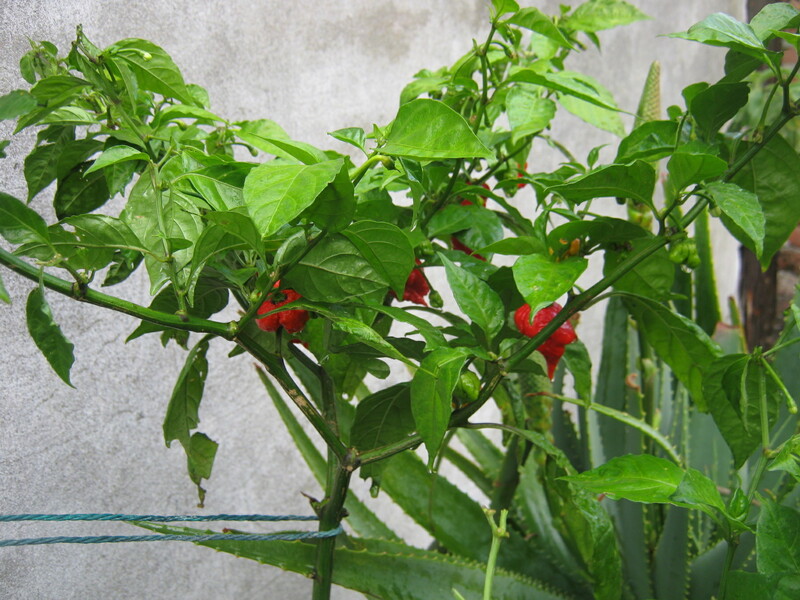 I believe that it will be a good practice to harvest chili pods in future as soon as they are ripe or maybe even a few days before that as this could prevent ear wigs to move in and destroy the fruit. 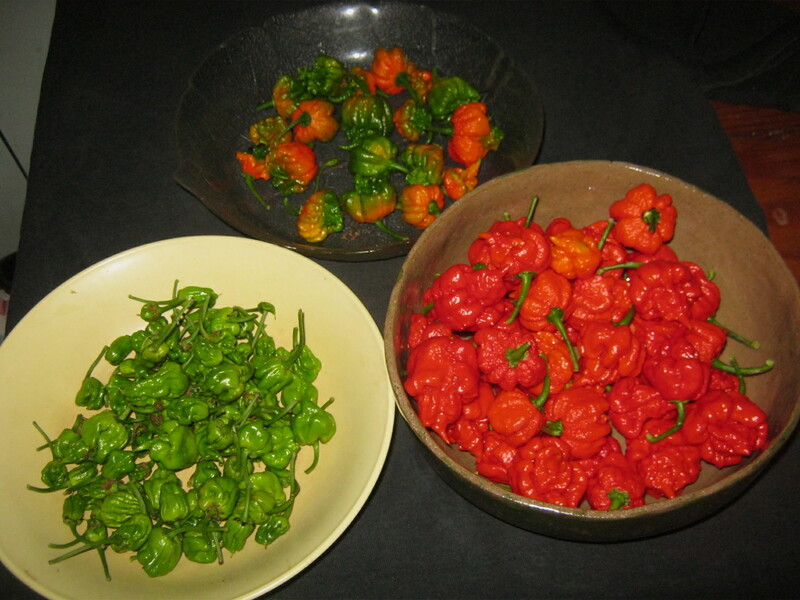 On the 28th of June I harvested seeds from the first 20 ripe chili pods. I chopped the pods in half and carefully collected the seeds from each of them. The pod with the lowest yield contained just 6 seeds while 37 seeds was the largest number I found in a single pod. The seeds have been placed in trays to dry. The halved pods I threaded on a fishing line and hung them in the kitchen window to dry. None of the seeds I have planted a month ago have yet germinated. This is not surprising to me as they take quite often more than a month to germinate even in warm and sunny conditions. I will keep an eye on them and see what will happen. The worms in the pot with the plant have eaten a lot of the organic materials I added a month ago and I will soon have to add more food for them. 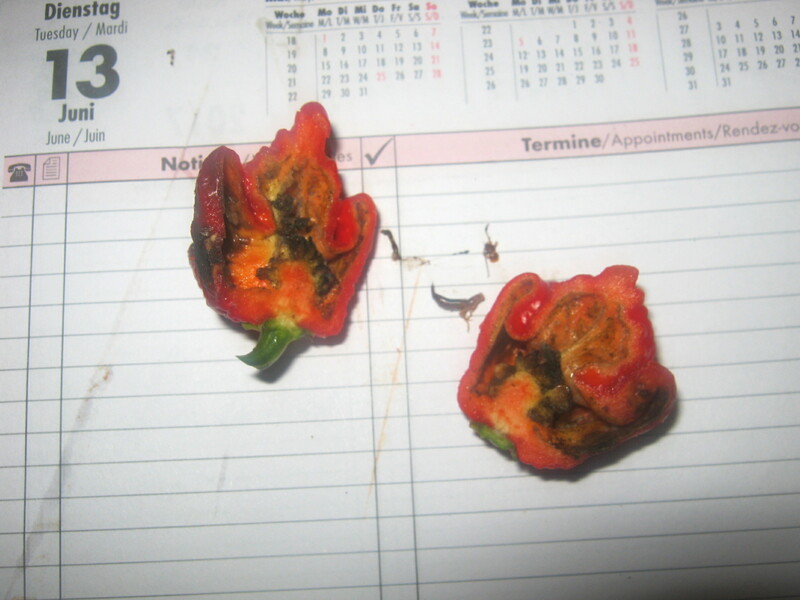 I hope you enjoyed the Carolina Reaper diary part 2 and will come back for the next updates in a month time.